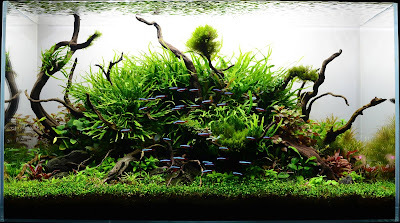 When it comes to aquascaping styles there is none more famous than the nature aquarium style. For many it is the style that brought them into aquascaping in the first place. You can't talk about nature aquarium without talking about Takashi Amano, after all he was the one that popularized this style in the early 1990's. The style has become quite popular over the years, ask anyone what their favourite style is, and most will reply " nature aquarium". It's also the reason many joined the hobby. And you can really understand why, a beautiful nature aquarium is aesthetically pleasing. Of all the styles its the one more in tune with nature, its not wild with no artistic input like the jungle style, however its not too over stylized like some of the more modern types of aquascapes or the older dutch aquariums. A nature aquarium still looks natural and evokes nature, something you can believe you could find on a stroll outside both above and below the surface of the water. Its origins comes from the mixture of the aquarium, Japanese gardening techniques and the philosophy of wabi sabi. This translates to a meaning that nature is beautiful, however it is imperfect, impermanent and incomplete as it is always changing and evolving. Nature aquariums try to replicate nature, both in its smallest and largest details. It can focus on a forest or a mountain, or smaller areas like a tree or some bushes. It all feels a bit unplanned and chaotic, however nature aquariums tend to be planned to smallest detail. Composition guidelines like the golden ratio and the rule of thirds are used to assist with the positioning of rocks and wood. Plants are chosen carefully to mimic the ones found in nature. It is all put together to make a scape that breeds nature into your living room. Plants grow wild, but at the same time are trimmed and shaped heavily by the aquascaper to maintain the design true to its vision. Symmetry is not allowed in this style as it does not look natural. One cannot talk about the nature aquarium without mentioning the use of co2, for many years it was almost certain that if it was a nature aquarium it was using co2. This also connects with Amano being the one that first introduced it into the hobby. 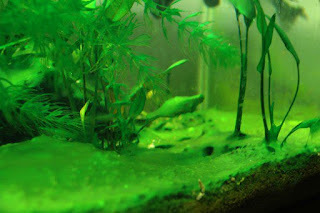 These days with the evolution of the equipment, techniques and careful choice of plants a lot of hobbyists are keeping nature aquariums in no co2 environments and they are beautiful in their own way. But to me the introduction of artistic design, co2 and careful arrangement of hardscape is what made the nature aquarium what it is today. 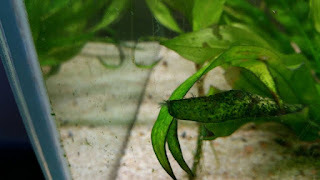 Before Amano people had been keeping planted aquariums for a long time, jungle styles, low-techs and most notably the Dutch aquariums were already doing a good job at keeping plants. However it was these three things that Amano brought into the table that really revolutionized the hobby. I could I also add the use of dedicated nutrient rich substrates, however many people will counter that they were using them to some degree much before Amano. But ultimately its the drive to replicate nature in its most imperfect and ever changing way that really sets the nature aquarium apart from all the styles that came before it and also after. To me that is Amano's greatest legacy, the nature aquarium. It's greatest example can be seen in Lisbon at the Florestas submersas exhibit, however for most of us this can easily be grasped by looking closer to home into our own aquariums.